Thanks to JCP: Liz Claiborne for sponsoring today's style post. As always, styling and opinions are all my own. A few months ago, I was reading in Inc Magazine (my husband subscribed me) about start up businesses. The article mentioned that one problem that many start ups face in their second quarter is burn out. Entrepreneurs and their employees typically work crazy hours, are crazy stressed, and end up going crazy. Wait - was I talking about myself? If you've been around this summer, you know how awesome and busy it has been with starting our business, but if you know me well, you know I crave order. The chaotic, messy business of life right now has been a hard adjustment, and now that we are four months in, I'm working hard on creating some balance. People say it doesn't exist, but I think it's worth trying for because at least we'll get a little closer to it. I already know that I work enough and I spend a lot of hours taking care of my kids, but I don't often take time to get out of the house myself - whether that is to exercise, visit with friends, or have a girls' night. (I'm sure I had this problem before I started my business too...) I find myself wearing and even craving cute lounge clothes and warm slippers rather than getting dressed to go out. I am all about cute lounge clothes as a WAHM, but there is something confidence-building about dressing up every so often too. It's a balance, right? Both of today's outfits style classic pieces from the Liz Claiborne Fall Collection, and they push me out of my current work-from-home lifestyle. I love basics, and these are pieces that I can style easily and use to create a lot of different looks. The chambray shirt, white denim, heather indigo cardigan, and wedges are perfect for fall, whether I'm grabbing lunch with a girlfriend or spending some alone time shopping. 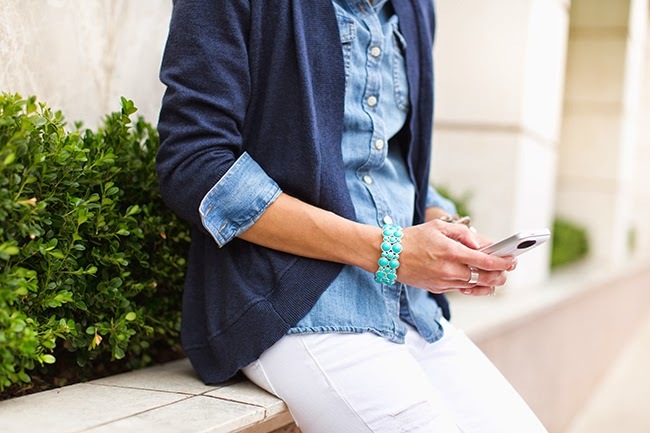 Ankle boots and layers are a great way to bring white denim into fall, and turquoise is always my go-to color pop. I love a pencil skirt as long as it's not every day, so the second outfit would be great for a nice date out with the hubby. A lace tee, cardigan, and pencil skirt are dressy, but not too much for me. Adding a bracelet, earrings, and a clutch (not a diaper bag) complete the date night look. It might take some convincing on my part, but I'd love to get Soren to come with me to the ballet or a play this fall. Neither of us get enough time out alone, and we certainly never dress up this much for dates. I kinda love the idea of stepping outside of that box. What do you do when you get some alone time? How do you try to create balance in your life? love both looks! my business has just started to get busier, so I totally appreciate your keeping it real and I totally understand that you need to take time for yourself! Take care of your self! Looking great Kilee. I really love the second look. Carson does a once-a-month sleepover at Grandma's. It's something we all look forward to. They'll take Wesley for a few hours while Steve and I go on a date. And with Wesley turning one in November, they're going to attempt to take him overnight as well. We usually just go to dinner. Or sometimes even run errands kid-free. Your post has motivated me to step things up for date night. It is fun to dress up a bit and make it special.